Arena di Serdica, 5 star luxury hotel is located in Sofia, in the heart of the city and is an excellent choice for business and cultural trips. Arena di Serdica is steps away from the main administrative, financial and shopping district, as well as the cultural and historic sights. 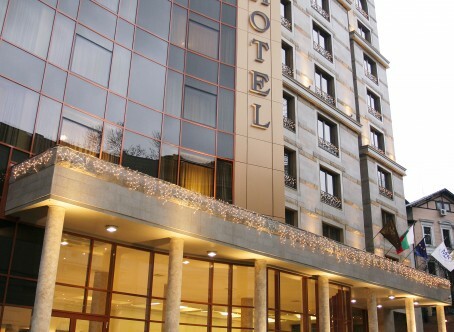 The hotel is easily accessible from Sofia International Airport (10 km) and the Central Railway station (4 km). The pearl of modern Sofia are the ruins of an ancient amphitheater dated from III century exposed at the ground floor of the hotel. Arena di Serdica offers accommodation in 63 spacious and cozy rooms and apartments. Dining facilities include: a panoramic-view restaurant with elegant and stylish interior, a sunny terrace with a magnificent view towards the Vitosha mountain and the city center; a classic restaurant & garden. Arena di Serdica Wellness club offers a modern gym with separate halls for men and women, unique relaxation area in the midst of the ancient walls of the antique amphitheatre of Serdica, massages and beauty treatments, sauna, steam bath and solarium. The hotel offers: complimentary Wi-Fi and wired unlimited high-speed internet access, complimentary indoor parking garage /preliminary reservation is required/, complimentary access to the gym for all hotel guests, safety deposit box available in each room and suite, around-the-clock room service. Modern hotel comfort, exquisite style and 5 star luxury.